The town of Yarmouth is one of the premier marine communities in the County of Cumberland. The area is replete with beautiful older homes, sheltered ports in Yarmouth Harbor and a New England style Main Street is known as the village. The town is known for its warmth and community spirit in keeping with its motto “Our Latchstring Always Out.”. The town is located on the southeast coast along the northeastern section of the county. It is considered a census designated place (CDP) within the county with a current population of 8,349 residents. The land area of the town is 13.35 square miles along with waterways comprising 9.59 square miles. The town is approximately 11 miles north of Portland with access from freeway of US Interstate 295 or US route one as well as state Route 88. State Route 115 also intersects the town going east to west. The Royal River courses through the center of the town and the Cousins River cleaves a section of Yarmouth from Freeport. The town may have a lot of history going all the way back to the 1700s, but unlike many of its neighbors the majority of its homes came under construction between 1960 and 1999. Approximately 33.9 percent of the homes in Yarmouth were constructed between 1980 and 1999. The decades between 1960 and 1979 represents 28.9 percent of the currently available homes. Single-family houses represent 86.4 percent of available residential inventory while condominiums make up another 11.3 percent. The average year of a home built in Yarmouth was 1973 with a total square footage of 1880 square feet. 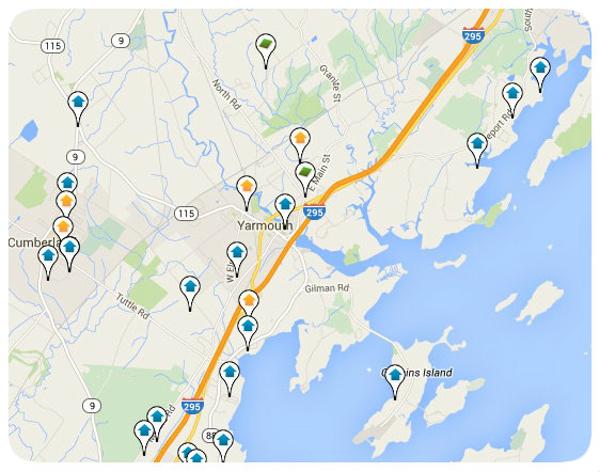 Yarmouth housing is represented by a wide selection of styles, tastes and floor plans. Floor plans in terms of square feet are divided among four specific sizes; 1400 to 1800 square feet represent 17.8 percent of the homes, 1,000 to 1400 square feet represents 19.2 percent of the homes, 2,400 to 3,600 square feet represent 21.6 percent of the homes and 1,800 to 2,400 square feet represents 23.5 percent of the homes. The homes of 1,000 square feet or less represent 10.2 percent of the total while 3,600 or more square feet represent 7.8 percent of the total homes in the area. Listing courtesy of The Flaherty Group. Listing courtesy of RE/MAX By The Bay. Listing courtesy of Portside Real Estate Group.